A new study from the Centers for Disease Control is pointing a greasy finger at Americans’ eating habits, finding that on average we get 11% of our calories in a day from fast food. But hey, that’s down from 13% since the last time the government poked around in our fast food eating habits. While it might sound like a bad thing that so much of our daily caloric intake is due to fries, burgers, fried chicken and other fast fare, experts say restaurants like McDonald’s and KFC are likely going to take the numbers as evidence that they’re not really contributing to the country’s obesity epidemic. The Associated Press spoke to a nutrition professor who thinks perhaps the decrease is just because people aren’t comfortable admitting to their fast food habits, now that consumers are turning toward healthier options. 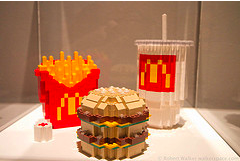 “If I were a fast-food company, I’d say ‘See, we have nothing to do with obesity! Americans are getting 90 percent of their calories somewhere else! '” she said. It sounds like there’s definitely some room for fibbing, as the study involved 11,000 adults answering questions about what they consumed in the previous 24 hours. Young adults were more likely to chomp down on fries and burgers, as the 20 to 39 age group consumed 15% of their daily calories with burgers, fries and the like, compared to only 6% of those older than 60. It didn’t matter how much money a household made, either, except for young adults who made less than $30,000. That group got 17% of their calories from fast food. Next How Do Restaurants Publicize Their Secret Menus? Next Up: How Do Restaurants Publicize Their Secret Menus?